LCT 540 SUBZERO, better than human hearing? How can a microphone be better than human hearing and what does that even mean? In this article, we cover self-noise, human hearing threshold, how to find a suitable preamp for a microphone, why low self-noise can be important and how to measure it. What is self-noise (equivalent noise level)? Self-noise or, more accurately, equivalent noise level is the sound pressure level that is equal to the RMS voltage that can be measured at the output connector of a microphone without an external sound source being recorded. In other words, there is a sound pressure level that matches the inherent noise of the microphone. This sound pressure level is the equivalent noise level (self-noise) of a microphone. Example: if a microphone has a self-noise value of 10 dB (A) SPL and picks up a sound source with 10 dB (A) SPL the signal to noise ratio is 1:1 or 50/50. A low noise level helps to keep the signal clean when recording quiet sources! The margin between the equivalent noise level and the maximum sound pressure level is referred to as the dynamic range of a microphone. Typically self-noise specifications only provide a single value for the self-noise, but as we will see in the following chapters self-noise is very frequency-dependent. Self-noise is the function of sensitivity and noise at the output of the microphone. Please note: It is not necessary to understand the depicted formula to follow the rest of the article. Why is the LCT 540 SUBZERO better than human hearing? To see how good human hearing is in a purely technical way we can look at the threshold of hearing. The International Organization for Standardization (ISO) standardized* the results of research institutes around the world that tested the hearing threshold of otologically normal people from the age of 18-25 years. They measure under free field conditions using pure tones (sine wave). We can already see that the hearing threshold is very frequency dependent. The human ear is less sensitive towards low and very high frequencies and most sensitive around 2 – 5 kHz. In the next table, we compare the hearing threshold to the 1/3rd octave band self-noise values of the LCT 540 SUBZERO. You can clearly see the self-noise of the LCT 540 SUBZERO is always below the threshold of hearing. Why use 1/3rd octave self-noise measurement? The threshold of hearing and even more so hearing, in general, is very frequency dependent. The main rationale for using 1/3rd octave band noise measurements is that their respective bandwidth closely follows the critical bandwidth*. The critical bandwidth is closely related to masking. Masking is the phenomenon when a sound is hidden by another. Masking is also very frequency dependent. Roughly speaking, the critical bandwidth for a given frequency is the frequency range where other tones can interfere and potentially mask the original signal. Think about a car passing by, masking the voice of someone speaking to you. To simplify a very complex psychoacoustic topic, one can say critical bands follow the 1/3rd octave bands. That is the main argument why a simple self-noise value is not sufficient to describe a precision instrument like the LCT 540 SUBZERO. Because the self-noise is frequency-dependent, using just a single value like the A-weighted self-noise would be like comparing the frequency range to a frequency response graph. Ask yourself: what tells you more about a microphone, a or b? Single value noise measurements always need to state which weighting filter has been applied (e.g., a flat frequency band, A-weighting, C-weighting, Q-Peak, etc.) The A-weighting was introduced to map sound pressure levels to the actual perceived loudness of sound pressure by humans. As we learned in the hearing threshold curves, humans are less sensitive towards low frequencies and very high frequencies. The A-weighting considers that. Environmental noise measurements are done in A-weighting for example. It is always important to know if a value in the specification is A-weighted or un-weighted. Microphone self-noise is typically A-weighted, EIN (Equivalent input noise) of preamps is typically un-weighted. Users must be alert to take weighting into consideration when comparing values. If the 1/3rd octave noise is below zero, why is the self-noise 4 dB (A)? Typically, the spec sheet of a microphone displays the self-noise in a single A-weighted equivalent sound pressure level. For example, the LCT 540 SUBZERO has 4 dB (A) self-noise. The total A-weighted self-noise of the microphone can be calculated from the individual 1/3rd octave band values by proper summing. Proper summing is important as noise is a random process and you cannot simply add the values together. What is the difference between acoustical and electrical self-noise? Electrical self-noise measures only the circuit of the microphone, the capsule will be replaced with a capacitor of the same value as the microphone capsule.Although electrical self-noise has no immediate relevance to the end-user, it indicates how well a circuit is designed. Acoustical self-noise measures the self-noise of the fully assembled microphone including its capsule. Acoustical self-noise is always higher than electrical self-noise as air molecules randomly bounce against the membrane of the capsule introducing noise. Please note: The electrical self-noise is not relevant to the argumentation of why the LCT 540 SUBZERO is better than human hearing. Measuring the acoustic self-noise is not an easy task. The better the microphone, the more difficult the self-noise measurement gets. You need a place where no outside noise will interfere with the measurement result. This is especially difficult for lower frequencies. To measure the self-noise of the LCT 540 SUBZERO, we needed to build a unique measurement device. It heavily dampens frequencies up to a 1/10,000th of their sound pressure. The whole frequency range of a microphone from 20 Hz to 20,000 Hz is dampened by 60 dB, up to 80 dB on the higher frequencies. On the right is our old measurement device, the massive device is our new custom built measurement device (4500 Kg, 9900 pounds). What preamp do I need? There is a very simple rule of thumb: EIN (Equivalent input noise) of the preamp should be 10 dB better than the self-noise of the microphone. If EIN of the preamp is 10 dB lower than the microphone self-noise, only 0.4 dB of noise is added by the preamp. First, we need to convert the self-noise of a microphone to a voltage. If the self-noise of the microphone in dBV is lower than the EIN of the preamp, the preamp dominates the noise. If the preamp value is much smaller than it does not degrade the microphone. Attention! We need to compensate for the fact that typically, EIN values for preamps are un-weighted, and microphone self-noise is typically A-weighted. The un-weighted value is about 5 dB lower than the A-weighted. A preamp should have ideally an EIN of -128 dBV (A-weighted), or EIN -123 dBV (un-weighted). One flaw in this calculation is that the EIN of preamps changes with different gain settings and load impedances (output impedance of the connected microphone). Manufacturers tend to specify the EIN at the maximum amplification, as they look best there. But most likely maximum amplification will not be required in typical applications. 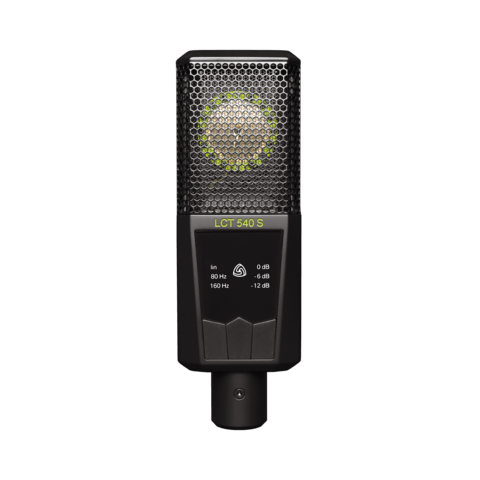 Besides the presented purely technical arguments, the following might help you understand, why the LCT 540 SUBZERO should be part of every studio mic locker. A new benchmark - The LCT 540 SUBZERO sets a new benchmark in terms of specifications for studio microphone. Just compare it to any other microphone! Personality lies in the detail - The LCT 540 SUBZERO can pick up the subtlest details in vocals or instruments. No technical boundaries - The combination of high sensitivity and low self-noise allows you to make an almost inaudible whispering sound crystal clear. Always on the safe side - Many noise issues only reveal themselves in post-production, once you start compressing the signals a previously inaudible noise floor can appear. Not with the LCT 540 SUBZERO. More than just a tool - As the microphone is an indispensable tool for every audio engineer, it is a great feeling to know that your most important tool will never be the weak link. Capture everything - You can hear the subtlest reflections of a good sounding room. Do not underestimate the unique character of a great recording room or classical concert hall.